Locally, the weather this week will be pretty standard for mid-August. It’s going to be hot. There will be a few opportunities for storms, but the majority of the week will see the majority of Southeast Texas dry. More on this in a second. First, let’s talk solar eclipse. We’re one week from one of the most talked about astronomical events in the U.S. in a long time. It’s certainly exciting, and understandably, there’s demand for eclipse weather forecasts. So, we’ll be happy to offer up our opinions here. First, locally, I think we look pretty standard in terms of thunderstorm chances. Odds are it will be partly to mostly sunny with just a few developing showers, mainly south and east of downtown Houston. 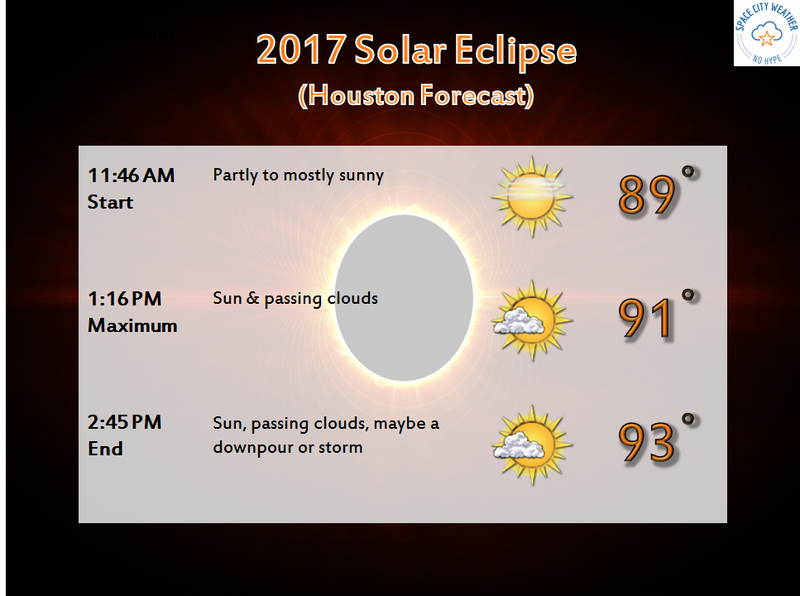 The initial outlook for eclipse viewing in Houston looks pretty typical for mid to late August: Sun, some passing clouds, and developing showers southeast of town. The good news is that, assuming standard summer weather here in Houston, you probably won’t have to drive very far to get out of a downpour and into sunshine. All in all, I’m optimistic on our weather for the eclipse right now. We’ll keep you posted. Some of you may be considering traveling into the path of totality of the eclipse, which stretches from Oregon into Wyoming across Missouri and offshore from South Carolina. We take a crack at things here, using some major cities along the path (Hopkinsville and Carbondale are the approximate locations of the greatest eclipse and longest duration of the eclipse respectively). It’s a bit early to pin down exactly how things will look, but initially, the greatest chance of disappointment may be on the eastern edge of the eclipse path over the U.S., in South Carolina. This can certainly change, however. Based on a brief look at the weather models for next Monday around the time of the eclipse, the best chance of rain may be in the Carolinas. Models disagree further west (including Nashville, Hopkinsville, Carbondale, and St. Louis), with a chance of rain showers potentially. For now, I’d spin it optimistically. I don’t see any reason to be overly nervous in any given place. I am watching a band of cloud cover showing up on some models from northern Colorado into Wyoming and perhaps the Plains (think Lincoln, NE & Kansas City). Again, it’s quite early for a precise cloud cover forecast, but we wanted to offer up an early opinion for you. Look for further updates this week. Back here in Houston, it just looks hot. Expect another scorching day Monday, with highs topping out in the mid or upper-90s this afternoon. No heat advisory is expected, as we look just a little cooler relative to the weekend. An isolated downpour is possible, but fairly unlikely for most (not all). Storm chances will nose up a little bit Tuesday or Wednesday afternoon as atmospheric moisture perks up overhead. Expect high temps in the middle 90s both days. Overnight lows will be uncomfortably warm the next couple mornings: upper-70s to low-80s. For late week, models show some signs that this brief surge in moisture will ease up a bit. Expect continued high heat and plentiful sunshine each day. Generally mid-90s should be expected. There are no real signs that this pattern is going to meaningfully abate as we head into the weekend and early next week. Tropical Storm Gert formed on Sunday afternoon. It is expected to stay in the middle of the Atlantic, possibly becoming a hurricane as it hooks north and out to sea, likely not impacting anyone significantly. Meanwhile, the atmospheric setup expected over the Atlantic later this week and much of next week is one that has been a historically favorable incubator for tropical systems. Weather models are in agreement on this and multiple models show a lot of noise coming out of the tropical Atlantic over the next two weeks. The animation above shows the GFS Ensemble forecast for the next disturbance, Invest 91L. Some of the ensemble members take 91L out to sea, some to the East Coast, some to the Gulf and/or Texas, and some to Mexico. This map animation is a good reminder that specific and accurate tropical weather forecasts more than a few days in advance are difficult to near-impossible. It’s still far too early to say anything specific about this potential disturbance and what it will end up doing, if anything at all. But, this is a very good reminder that we are in the heart of Atlantic hurricane season once again, and it’s a great opportunity to make sure you are prepared in case something does happen to come our way. We’ll let you know if that’s a serious concern at any point. Sitting here early on this Monday morning, it is not, but it will be something we’re going to continue watching closely. One note on the eclipse – I have two groups of friends going to see it, one in Wyoming and one in Nashville. They both say all hotel rooms are now booked. So if you are planning on going at the last minute, be prepared to sleep in your car. I’m normally a wait and see guy, but the European model is showing a pretty healthy storm in the gulf 10 days out. It did a pretty good job predicting Franklin 7 days out, only missing landfall by about 100 miles to the north. They just get lucky or is this model getting pretty good at these extended times? The Euro is generally the better skilled of the models for sure. So when you see what it’s showing now, you take notice. But, even in recent history, for a couple runs, several ensemble members took Invest 99L (now Tropical Storm Gert) into the Southeast US as a hurricane (which is not going to happen). So it is prone to misses just as much as any other model. With tropical systems, especially ones that have not formed yet, you cannot use a single deterministic weather model like the Euro. You have to take an accumulation of evidence into account. And doing that today, there are many, many options for this system, including not forming at all. So watch and wait, but no need to get too worked up yet. Good call. Latest run of the European model no longer has the storm in the gulf. 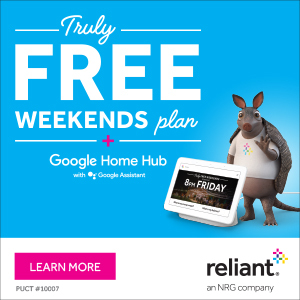 A silly question, but . . . about the time the eclipse is maximum here, any chance the temps might drop 2 or 3 degrees? Yes, it will have a slight cooling effect. Anyone know where one can buy “eclipse glasses” in Houston? Here’s the best advice I have for you.